Enhance Secure Development with Application Hardening & Obfuscation. Improve compliance and hinder attacks against your .NET, Xamarin, UWP, .NET Core and Unity Apps. Used by thousands of corporate clients in over 100 countries in virtually every industry. Dotfuscator is a .NET Obfuscator and App Hardener that helps companies with apps "worth protecting" secure trade secrets (IP), reduce piracy/counterfeiting, and protect against tampering and unauthorized debugging. Dotfuscator works with all flavors of .NET including Xamarin, Unity, ASP-NET, and UWP apps. PreEmptive Protection also supports Java/Android and iOS apps. Advanced renaming, control flow, string encryption, metadata stripping and other transformations provide the highest degree of protection. Dotfuscator creates native Visual Studio projects able to detect and resolve assembly dependencies, stream output directly into signing or other post-build steps. From mapping to Agile, continuous integration, support for debugging, patch management and distributed development, Dotfuscator is a reliable component of your manufacturing process. 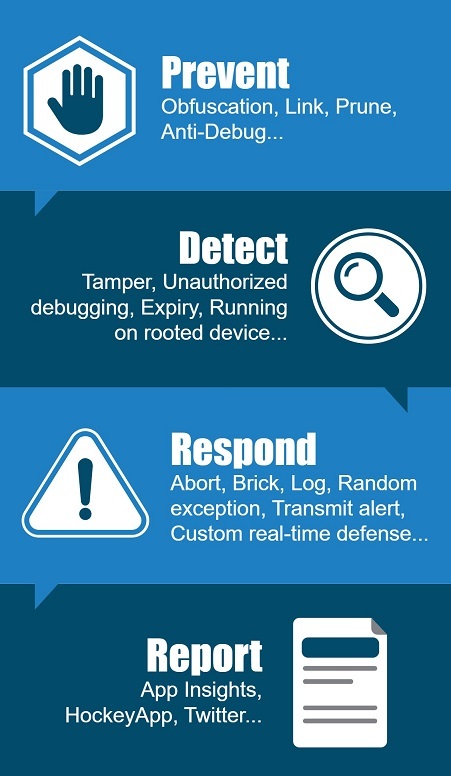 Terminate or modify the execution of tampered applications or unauthorized debugging and transmit incident alerts. Compaction can significant reduce app size. Linking consolidates multiple assemblies in to one easy to manage executable and watermarking hides copyright and other unique information in your app. PreEmptive Solutions has been the sole supplier of obfuscation technology to Microsoft since Visual Studio 2003. Dotfuscator is a formal component of Microsoft's internal Visual Studio development process. Dotfuscator is subject to all of Microsoft's quality, regression, audit and control gates. Our dedicated professional support team is available by phone and email and supported by our extensive online documentation and knowledgebase. Given the critical nature of software, it is no wonder that 9 of the 10 largest technology suppliers use PreEmptive Protection on their apps worth protecting. Security standards bodies, regulators, legislators, and the courts recognize the necessity to secure data in use. In addition to increasing your risk of a data-related breach, failure to implement appropriate, well-understood and accepted app protection-security controls could result in increased liability, fines, and brand damage. Is your app worth protecting? Does it access sensitive data? Does it perform a critical function? The Community Edition (CE) is included with all versions of Visual Studio and offers basic application protection features such as the ability to obfuscate method names, etc. The Professional Edition is available for evaluation or purchase and includes enterprise-grade protection, dedicated support, and commercial licensing. To learn more, please compare editions.